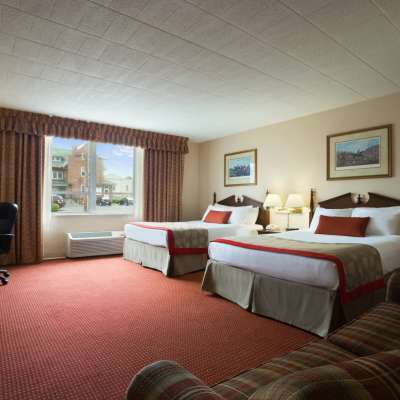 Cheer on the Pittsburgh Steelers as they head to Saint Vincent College from July 26 to August 14 for 2018 Steelers Training Camp in the Laurel Highlands. 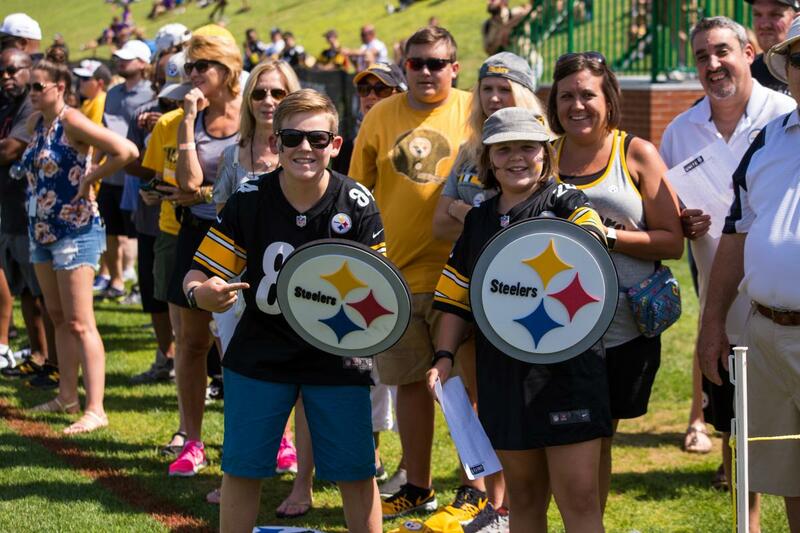 Steelers Nation has gathered at Saint Vincent College for more than 50 years to watch the team get ready for the upcoming season. 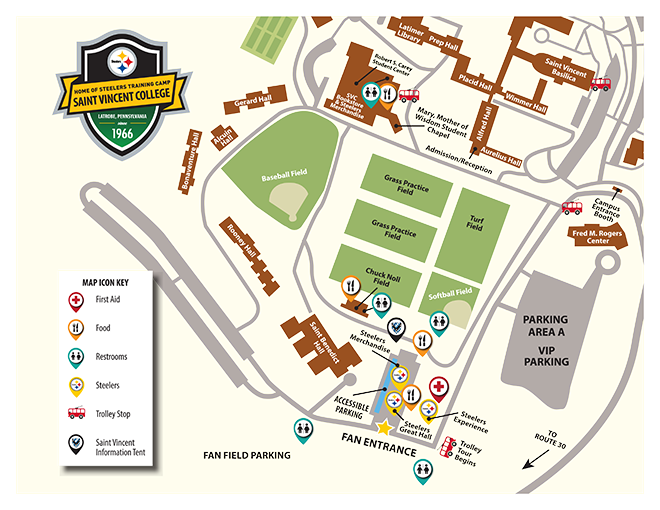 Frequently named the most fan-friendly training camp in the NFL, Steelers Training Camp is free and open to the public (on selected dates below). Wednesday, July 25 - All players report by 4 p.m.
Thursday, July 26 - 2:55 p.m.
Friday, July 27 - 2:55 p.m.
Saturday, July 28 - 2:55 p.m.
Sunday, July 29 - 2:55 p.m.
Monday, July 30 - 2:55 p.m.
Wednesday, August 1 - 2:55 p.m.
Thursday, August 2 - 2:55 p.m.
Saturday, August 4 - 2:55 p.m.
Sunday, August 5 - 2:55 p.m.
Tuesday, August 7 - 2:55 p.m.
Saturday, August 11 - 2:55 p.m.
Sunday, August 12 - 2:55 p.m.
Monday, August 13 - 2:55 p.m.
Tuesday, August 14 - 2:55 p.m. The public is generally permitted to access the campus at 1:30 p.m. Visitors are allowed to bring blankets and chairs, but seating is also available in the stands at Chuck Noll Field. No video cameras, alcohol, grills or pets allowed. Merchandise, snacks and drinks are available for purchase. Fans can ask players for autographs and photos as they enter and leave practice. 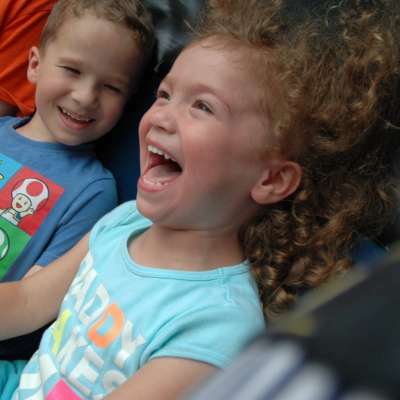 The Play 60 Fun Zone, a kid-friendly activity center open during practice. 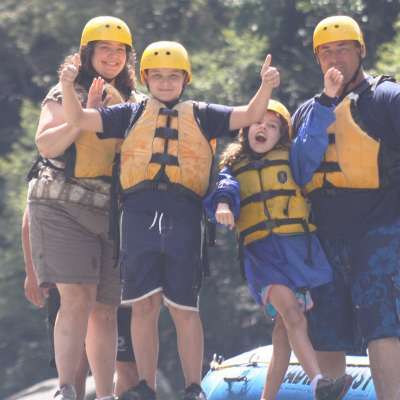 Children can experience simulated practice sessions and more athletic activities. 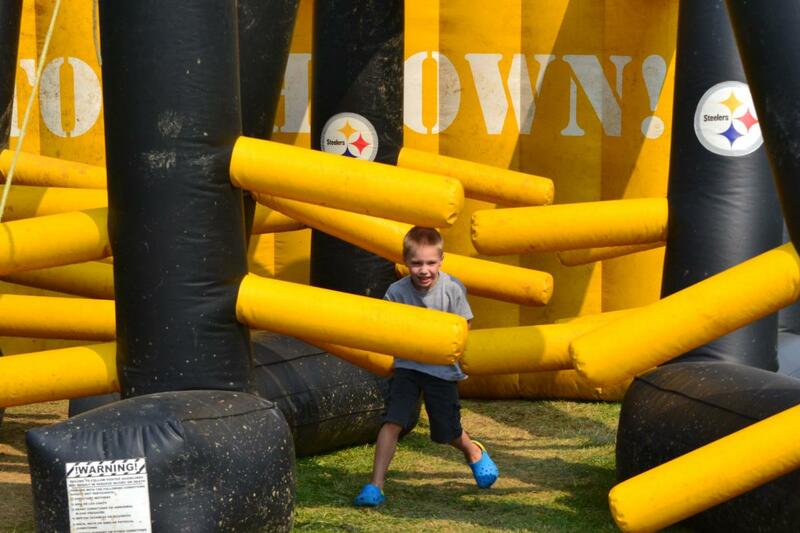 The UPMC Steelers Experience where kids can kick field goals, conquer an obstacle course and get their faces painted. Taking unique photos at photo booths and with player cutouts. Winning prizes from the Steelers Nation Unite tent.